Just a short note to let you know that if you have any younger brothers or sisters and they like a fun, creepy little scare on the run-up to Halloween (and really, who doesn't?) 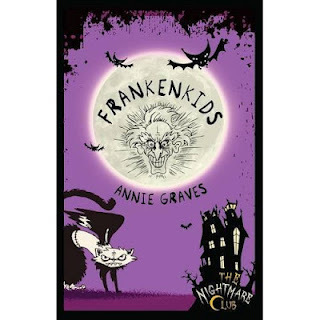 then my suggestion is to check out Frankenkids, by Annie Graves. I'm not going to tell you what terrible fate befalls them. All I will say is that David Maybury better watch out. In the next short story, he's getting his head cut off. Can you Get it on Amazon?? I'M LAUGHING A LOT, NOW. HI DEREK!!!!!!! Say hi back? Please? I have been gone for so long!!!! Derek here's what I was going to have NJ give to you i had a picture but if you look on my Blog post about Derek-lizard you'd see. Hi Derek! I know I'm back again. But I have to say hi! When will you get over to America? But anyhow. I just got like a question or 2. So, Scarab. What was his magic? This is causing debate and I want to know. I think he was like China. But also he could be like, a Necromancer or something. So could you just please tell me? Now, my other thing. I swear. Did you enjoy my spazz attack? Hmm? Dont give me the innocent look. You demoted me from Grand Mage. Now Im curious, did you do that on purpose? I mean I honestly dont care but the whole point was now my friends arent sure if they should continue to call me 'Grand Mage.' now my last thing. Explain this, how is America split by Sanctuary? I know Davina Marr was from one of the American SANCTUARIES so, how does that work? There. I promise i finished. Oh and can I have a hug? Well, things are about to be very urm weird for me, cause my sis, who is sitting next to me is about to come on. OH Please say hi net girl when she comes on, please! I NEED YOU TO ANSWER ME! Y'know how you're going to be in Glór in Ennis, soon? And how it says it's suitable for fourth, fifth and sixth classes? Would a First Year be able to sneak in? With the advantage of being your friend? The reason why i call her net girl is cause she ran into the net when we were playing tennis. and please call my sister any insulting nickname, feel free to be creative. NETTY! That was uncalled for. in school, I drew up this THG thingy of SP stuff. I AM NOT DOING THE BOOT CAMP! i love how were just having our argument, on a blog, across the room from each other with every one ignoring us. So how is everyone celebrating Halloween? And I just realised that my "memories" from yesterday are actually today's memories. I should just get a reflection. ~ Oh my gosh, I was just about to say that! That's cool Zafira. 'S cool. Me and a friend are going as sumo wrestlers. Depending on whether I have time and how much work I have. I want to dress up for Halloween..
OH, I have to go. Bye. DON'T BELIEVE ANYTHING THAT MY SISTER TELLS YOU, ITS ALL LIES!!!!! Thats cool rose and Zafira. I wonder if there is an American sanctuarie for each state??? I'm not celebrating Hallowe'en because... I don't know. I'm just not. Derek, is Skulduggery a cat person? Luce i hope Derek comes on, I really do. I just want an answer...I really do. Derek please come on and answer Willows question. Us Irish minions need to know. Oh and if you come on will you also pinky swear about the promise you made? Why is it that the only Aussies I don't want to talk to are up, now!? Zaf- Scarab's power was the amazing ability to... to... okay, I totally forget. It's around here somewhere. If I find my notes, I'll tell you. As for the Grand Mage thing.. heh, yeah, you got fired. Cuz you went ROGUE. Or something. You're a ROGUE Grand Mage! And America has three Sanctuaries, each one of them run by one of the three Elders. Willow- they said it's suitable for those classes purely as a minimum age range- they didn't want anyone younger going. Anyone older is fine! Luciana- Skulduggery was a dog person when he was alive! Now he avoids animals altogether. And hello to everyone who is about to write "say hi to me! ", because I'm off! Have a good night! The Nefarian Pengine one was cool Colleen. Thanks for the news about the Signing Derek. And you so did not just fure me...yes you did, thanks can i be an Elder? Willow, when is the signing on again? And, also, Derek, if you see this, it's your fault I have friends. I think I have it written down somewhere but if you could remind me it would be great. I need to print that out for my wall of blogspeaks, now! *hugs Derek* THANK YOU, DEREK. MUCH LOVE. Yeah, I would like to know as well. It doesn't say much about it in the books except for the spiderlike device. Well im excited. I wish we could see Scarab in his younger days. I bet he was epic. Vinniette says she wants to fly to Ireland to go off on Derek for firing me. I assure you , Derek, I told her i'd personally arrest her if she tried. I told her I'm loyal to my Golden God. I'll tell you if Derek tells us what magic Scarab uses. I don't think we've met? And if we have met its all your fault for being unmemorable. Chief annoyance around these parts. I'm a natural teleporter and do a bit of symbolism on the side. Oh, and I'm also quite fond of suits. Okay, I guess he's not here. WE NEED SYMBOL MAGIC/LANGUAGE MAGIC EXPLAINED! CAN AN ELEMENTAL OR ADEPT AFTER THE SURGE LEARN/USE SYMBOL MAGIC? And if so, why has China not chosen any more Adept abilities? I've been reading Valduggery fanfics, some of them are pretty good. "Derek, Landy lunch is ready!" LOL!!! ok i'm sorry but it is funny!!! and i find it amusing!!! Oh well look on the bright side thier only half as good as you!!! get it because there only half your name each! ok the other bright side is that you kind of star in a book! ... not that you couldn't of done that on your own but still! I'm sorry for being mean Derek but i find this all very amusing! ... apart for them being the victoms!!! that's not so nice!!! A but Derek started it, so I'm sure he's prepared for a literary war. yea! cuting off the head is a good move!!! Yeah, it kills almost everything except hydras. Oh i've got a good question! Derek what is your Middle name? and no, we havent met yet eden! nice to meet u to!!! here, ill shake your hand!!! Hey Eden! I can't believe I missed Derek! It was a flying visit. More of an airdrop visit. THIS IS REALLY IMPORTANT, DOES ANYBODY KNOW IF IPADS ARE FOR LEFT OR RIGHT HANDED PEOPLE. Because apparently I am at risk of getting killed. They can be for either, Eden. Whatever's comfortable, just...flip it around. if u flip it wouldnt it be the same????? Hi Forest! I don't think we have met! No one is allowed to I shot Eden, or else they answer to him! Oh no it's just an inside joke between me and Death. Eden, I think iPads are for right-handed people! I could be lying dead with an iPad in my mangled elect hand. And that tiger Eden got from Berlin? Yeah, that one, that was some freaky were-tiger! If you were a were tiger you wouldn't be able to do any other magic. It would be used up transforming. And i haven't twisted grav in ages!! Derek, does Valkyrie have a habit for running into things? She should. Really. I'd like to see how SHE reacts to smacking her head into walls. kids Derek and Landy... lol. this is the quickest i have peeked at a post... proud of myself. How do I figure out if I just gave myself a concussion? Doctor Nye, can you do anything? Yes, but it takes time... And money... Are you willing to do it? Anything! I miss being able to twist gravity! Of course I am going to hold still! I am bloody strapped to a table! Okay, it is done... Now for the payment! You go to a doctor. Go run into a wall and if you see double then... You gave yourself a concussion! What if I can't go to a doctor? I smacked my head super hard into the wall a few minutes ago, and it hurts it to walk. Is that bad? Yes, that is pretty bad Cain... I'll look it up! But what I will say every time you ask me something like that is seek professional help. Do not apply ice directly to the skin - use a washcloth as a barrier and wrap the ice in it. You may also use a bag of frozen vegetables wrapped in cloth, as this conforms nicely to the shape of the head. Apply ice for 20-30 minutes at a time and repeat about every two to four hours. There is little benefit after 48 hours. Rest is important to allow the brain to heal. Ensure that the athlete is evaluated by a health care professional experienced in evaluating for concussion. Do not try to judge the severity of the injury yourself. I've got a headache, a really, really, really bad one, I'm dizzy and I keep almost walking into everything. I usually walk into everything, so that's no different, but I never get headaches. Also, attempting to lean back or lay down hurts. I tried to say I had a concussion, but my mum said I basically hit my head really hard and it hurts a whole bunch. Joking! To to the doctors! Seriously! Please you have to! Eh. Whatever. She says it just hurts because it just happened, but it happened over an hour ago. No... I'll go do that. I have no ice pack-like things... And my mum said that even if it IS a concussion, there's not really anything a doctor can do. Frozen peas? Ice itself? Something in your freezer? I don't really have anything in my freezer... I'm gonna find something to do about it. Eden, I am assuming you have fallen asleep? I run into more things than the wind blows! And when I say run, I mean full on sprint! I had another name for you, didn't I? I'm good and I have to leave... Flesh and Stone is on!! Hel, yeah, I think so. I know someone was calling me Kest...? No, I didn't call you Kest. It was something much better. OI, MATT SMITH IS MINE. THAT'S ALL I HAVE TO SAY. WELL, THE DOCTOR, CAPT JACK, ARTHUR DARVILL, DAN AND PHIL ARE MINE! Haymitch, Snape, Springheeled Jack, and Mevolent are mine. Yeah, you caan have him, I've already seen him naked. Hel, The Eleventh Hour. It was a-freaking-mazing. I'm gonna start watching for real in the next season. But I want Springheeled Jack! Oh well, I get Sanguine, Skulduggery, Ghastly and Ravel.